For those who celebrate Christmas, a nativity scene is a sure sign that the season is in full swing. The tradition is followed by Christians the world over. Its originator is thought to be St. Francis of Assisi, who according to tradition created the very first nativity scene in a cave outside the village of Grecco, Italy on Christmas 1223. After receiving the permission of Pope Honorius III to go ahead with his unprecedented idea, Francis staged the first nativity scene on December 25, 1223. The scene was set up using live people and animals, lit only by the lanterns of those present and the stars above. Midnight Mass was celebrated, and Francis preached to the congregation about the true meaning of Christmas, brought home very effectively by the living, breathing representation right before their very eyes. When everyone had gone home after Mass, the Brothers started to gather up the hay from the manger scene to dispose of it, but Francis told them to save it for the forest animals. The legend then goes that all of the sick animals in the area that showed up to partake of the hay were immediately cured of what ailed them. Over the years, these nativity scenes gained enormous popularity. During this period, mystery or miracle plays, which re-enacted Bible stories in local dialects, had enormous appeal in Europe. As the Mass was said in Latin, something common folk rarely were fluent in, these miracle plays were one of the only ways for simple folk to learn scripture and emotionally engage with their religion. 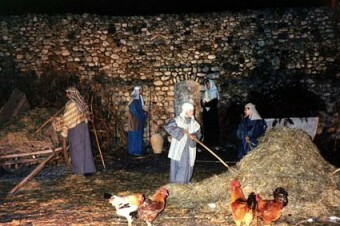 Live characters began to be replaced with figurines in many cases, often resembling the people of their place of origin, before ultimately the Church banned live reenactments of the nativity scene starting around the 15th century. Today, nativity sets can be mass produced in plastic, or crafted of the finest porcelain and it’s the rare kid who hasn’t had the cross-over meeting between the manger scene and Santa’s workshop (Rudolph chilling with the donkey, an elf catching up with the Little Drummer Boy). And to think this was part of an 800 year-old tradition started by a saint fighting against materialism. Since the prior portion of the article dealt only with the Catholic Church, the assumption must be that “the Church” here refers to the Catholic Church. Therefore, I would like to see proof of the alleged “ban[ning of] live reenactments of the nativity scene.” I doubt that it ever happened, and it is not mentioned in the “references” linked above. The accusation seems to be based on a misunderstanding — or it may be another in the seemingly interminable anti-Catholic claims that one can find on the Internet. Without a doubt, the Catholic Church prevented the use of live reenactments WITHIN sacred church buildings, where they would have been inappropriate distractions during Mass — but almost certainly there was no banning outside (unless, I suppose, such displays had been shown to be ways in which plagues could be spread). What seems more likely to me is that those who banned live reenactments were Puritan officials in England, who, being anti-Catholic and anti-Anglican, were strongly against such supposedly idolatrous portrayals (and, if I recall correctly, against various other forms of celebration on Christmas Day). Mass began to be celebrated in Latin, in much of the Roman Empire, precisely BECAUSE the “common folk” WERE “fluent in” it! [In the Eastern Empire, the Catholic liturgy was celebrated in Greek and in other languages.] As modern Romance languages developed, the average person in the “West” could still undertand many Latin words. As non-Romance languages developed, uneducated people could not to understand the texts of the Mass (many prayers and Latin readings from Scripture), but they could have the Latin explained via sermons and conversations with priests. And, of course, it was the Catholic Church that zealously protected the Bible, painstakingly (and at great expense) copying it by hand for fourteen centuries. Between 700 and 1500, many translations of the Bible (from Greek, Hebrew, and Latin) were made into vernacular languages. It was a Catholic (Johann Gutenberg) who invented the printing press and made the Bible — a full Catholic Bible, with all 46 books of the Old Testament — his first printed work! Thanks for this opportunity to set the record straight.